Since then he has had roles in films such as The Dark Knight Rises (2012), Starred Up (2013), Mississippi Grind (2015), Rogue One: A Star Wars Story (2016), Darkest Hour (2017) and Steven Spielberg's adaptation of Ready Player One (2018). In 2017, he joined the Marvel Cinematic Universe as Talos, appearing in Captain Marvel (2019). Mendelsohn starred in the Netflix series Bloodline (2015–2017), for which he won a Primetime Emmy Award for Outstanding Supporting Actor in a Drama Series from two nominations, and received a Golden Globe nomination. Mendelsohn was born in Melbourne, Victoria, the son of Carole Ann (née Ferguson) and Frederick Arthur Oscar Mendelsohn. His father is a prominent medical researcher who previously headed the Howard Florey Institute in Melbourne, where he maintains the status of Professor Emeritus. Ben and his two brothers, Tom and David, as well as his mother (deceased), a registered nurse, lived in Europe and the US for long periods of time, and returned to Melbourne when he was in high school. He attended Heidelberg Primary School and Eltham High and Banyule High schools. He took drama because he thought it was an easy class. Mendelsohn was the only one of his friends to follow up with an audition for Crawford Productions that was being advertised. In October 2009, he was featured in an episode of the Australian series Who Do You Think You Are?, which traced the ancestry of his paternal grandfather, who was from a Jewish family, as well as of convicts on his mother's side. Searching for a connection to composer Felix Mendelssohn, which was eventually dismissed, he discovered links to 19th-century Prussia. His ancestors were among the first Prussian Jews to be naturalised in Schneidemühl in the province of Posen, now Piła in modern Poland. He also has Greek, German, and British Isles ancestry. After several early television roles, including The Henderson Kids alongside Kylie Minogue, he attracted notice in his breakout film, The Year My Voice Broke (1987), and won the Australian Film Institute Award for Best Supporting Actor. His next major role was in The Big Steal (1990), and Spotswood (1992), co-starring with Anthony Hopkins; this was followed in 1994 by Metal Skin and in 1996 by Cosi and Idiot Box. In 2000, he was in two contrasting films, the Australian Mullet and the Hollywood Vertical Limit. In 2005, he was preparing to play Mark Antony in the Sydney Theatre Company-produced Julius Caesar, and he was in the Terrence Malick-directed film The New World. In 2007, Mendelsohn starred in the third season of the TV series Love My Way and in 2008, he appeared in Baz Luhrmann's Australia. He filmed the 10-part Melbourne series Tangle, which premiered on Showcase in 2009. In 2009, he appeared in the American science fiction film Knowing directed by Alex Proyas. The same year, Mendelsohn starred as Ned in Beautiful Kate, directed by Rachel Ward, opposite Bryan Brown and Rachel Griffiths. In 2010, he appeared in Animal Kingdom, starring in the film as Andrew "Pope" Cody, a criminal on the run from the law living in the notorious Melbourne Underworld. The role won him many awards, including IF Award's Best Actor and the AFI's award for Best Actor in a Leading Role. He was also named by GQ Australia as Actor of the Year for 2010. Mendelsohn was selected as one of the subjects in the Who's Who in Australia 2012 edition. In 2012, Mendelsohn played the supporting roles of John Daggett in Christopher Nolan's The Dark Knight Rises and Robin Van Der Hook in Derek Cianfrance's The Place Beyond the Pines. In 2012, he appeared in Florence + the Machine's music video for "Lover to Lover". The video was directed by Vincent Haycock. In 2013, he guest starred in the TV series Girls as the father of Jessa, played by Jemima Kirke. In 2014, Mendelsohn joined the cast of Bloodline, a Netflix original from the creators of Damages. The first season premiered on the site on 20 March 2015 and was well received. Mendelsohn's performance on the series was lauded by critics, resulting in a Primetime Emmy Award win as well as a Golden Globe Award nomination. In September 2016, Netflix announced that the show had been cancelled, and that it would end after its third season in 2017. Season 3 of Bloodline received negative reviews, and Mendelsohn appeared in two episodes of it. In 2016, he appeared in video as an onstage "stand-in" during the Nostalgia For the Present concert tour of Australian singer Sia Furler for her song, "Breathe Me". In December 2016, he had a supporting role in the Star Wars franchise's Rogue One, portraying villain Director Krennic. He called the opportunity to act in a Star Wars film "a childhood dream come true". Mendelsohn also narrated the virtual band Gorillaz' fifth album Humanz. While filming Adoration, Mendelsohn took time free to pose for artist Sally West, with whom he had been neighbours in Bondi in the 1990s. The resulting portrait has been nominated for several awards. Mendelsohn married British author Emma Forrest in June 2012. He has two daughters, one with Forrest, born in 2014, and one from a previous relationship. He was divorced from Forrest in 2016. He is an avid fan of video games, citing The Last of Us as his favourite game. 1984 Special Squad Episode: "Slow Attack"
Police Rescue Dean Forman Episode: "Wild Card"
Halifax f.p. Peter Donaldson Episode: "My Lovely Girl"
^ "Ben Mendelsohn – Episode 3 – Season 2 – Who Do You Think You Are?". SBS. 15 August 2012. Retrieved 13 April 2014. ^ Sullivan, Leanne (2009). Who's Who in Australia. Crown Content. ISBN 978-1-74095-166-1. Retrieved 13 April 2014 – via Google Books. ^ "Professor Fred Mendelsohn". The Florey Institute of Neuroscience and Mental Health. Archived from the original on 7 April 2016. Retrieved 8 April 2016. ^ "Who Do You Think You Are?". SBS. ^ "Ben Mendelsohn: behind the bad guy mask". 26 June 2017. ^ "Film institute award winners". Canberra Times. 10 October 1987. p. 10. Retrieved 20 October 2018. ^ McDonald, Dougal (22 February 1992). "Feel-good movie, but lacks drama, tension". Canberra Times (ACT : 1926 - 1995). p. 42. Retrieved 20 October 2018. ^ McDonald, Dougal (6 May 1995). "Probing young people's injured psyches". Canberra Times (ACT : 1926 - 1995). p. 56. Retrieved 20 October 2018. ^ "Ben Mendelsohn: Mark Antony". Life Matters. ABC Radio National. 18 July 2005. 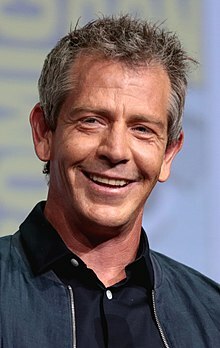 ^ "Ben Mendelsohn". GQ. 17 December 2010. Retrieved 13 April 2014. ^ Delany, Colin (8 December 2011). "Emile Sherman, Ben Mendelsohn and Lizzy Gardiner recognised in 2012's Who's Who". mumbrella.com.au. Retrieved 13 April 2014. ^ McFarland, K. M. (24 March 2015). "Kyle Chandler Isn't Bloodline's Star. This Unknown Actor Is". Wired. Retrieved 26 March 2015. ^ Grozdanovic, Nikola (31 March 2015). "Netflix Neo-Noir 'Bloodline' Gives Viewers The Tragic Anti-Hero Television Has Been Waiting For Since Walter White". Indiewire. Retrieved 31 March 2015. ^ Fowler, Matt (24 March 2015). "Bloodline: Season 1 Review". IGN. Retrieved 24 March 2015. ^ Travers, Ben. "Bloodline Season 3 Netflix Review: A Meaningless Ending — Spoilers". www.indiewire.com. Retrieved 2017-10-19. ^ Prudom, Laura. "'Bloodline' Ending After Season 3 on Netflix". Variety. Retrieved 14 September 2016. ^ Stevenson, Jane. "Crowd eats up pop star Sia's minimalistic show". Toronto Sun. Retrieved 6 November 2016. ^ Patterson, John. "Rogue One's Ben Mendelsohn: 'Star Wars is a childhood dream come true'". The Guardian. Guardian News & Media Limited. Retrieved 14 December 2016. ^ "Sally West: The Bird of Song with Claws of Paint". Shayan Barjesteh van Waalwijk van Doorn. Art Aesthetics. Retrieved 2017-09-11. ^ Maddox, Garry (6 October 2012). 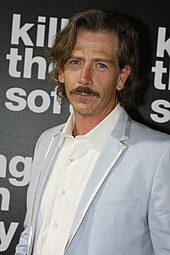 "Killing Them Softly, How Hollywood Fell For Ben Mendelsohn". Sydney Morning Herald. Retrieved 13 April 2014. ^ Hornaday, Ann (5 April 2013). "Ben Mendelsohn is everywhere. Finally". Washington Post. Wikimedia Commons has media related to Ben Mendelsohn.